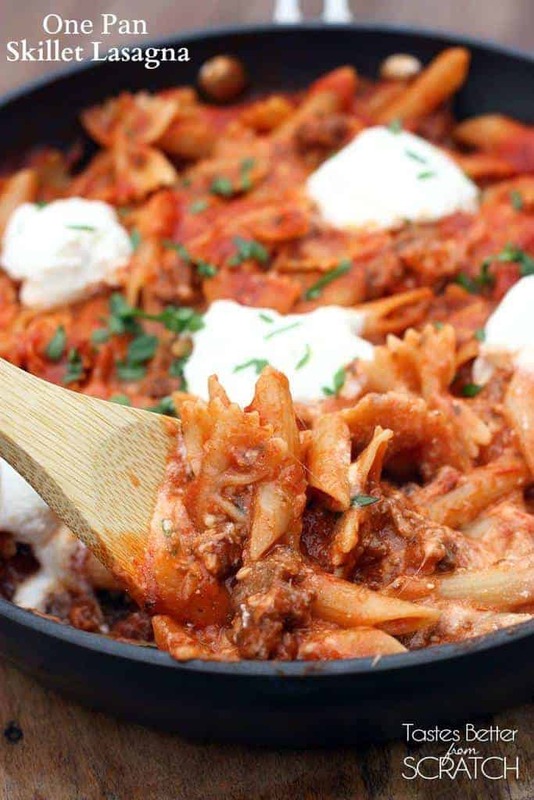 This one Pan Skillet Lasagna with bite sized pasta, parmesan, ricotta, and mozzarella cheese is what comfort food is all about! 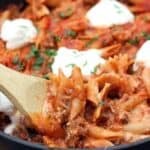 This One Pan Skillet Lasagna is fantastic! No layering of noodles, and no mess. 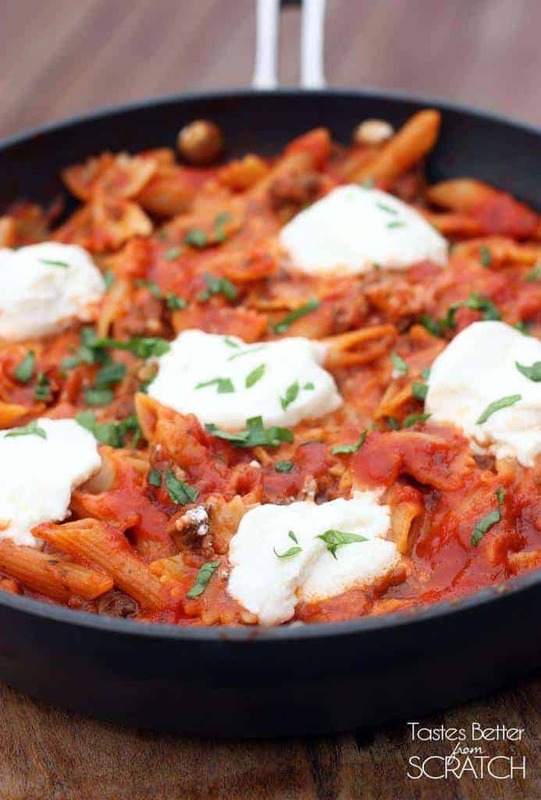 The pasta is cooked right in the sauce, with gives it an extra delicious flavor, and I added some small spoonfuls of ricotta cheese on top, with some fresh chopped basil. The flavor is spot-on, and the whole dish couldn’t be easier to make! Heat olive oil in a large skillet over medium high heat. Add ground beef and season with some salt and pepper. Brown meat and drain grease. Stir in garlic, minced onion, pasta sauce, oregano, basil, garlic powder and red pepper flakes. Season with salt and pepper, to taste. Bring sauce to a simmer and stir in pasta and water. Bring to a boil; cover, reduce heat and simmer until pasta is cooked through, about 13-15 minutes. Remove from heat. Stir in parmesan and mozzarella cheese. Spoon a few scoops of ricotta on the top, and cover for a few minutes to allow the cheese to warm. Top with fresh basil. Serve immediately. 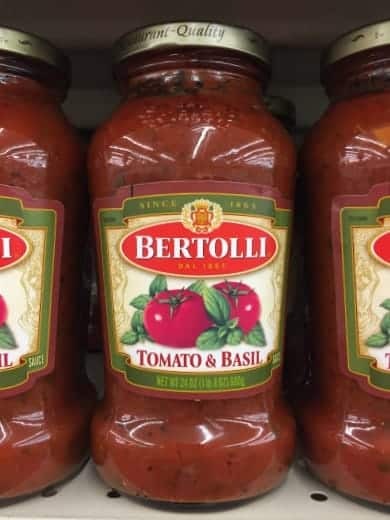 You’ll notice I used a jar of Bertolli Tomato Basil sauce in the recipe, because I really like the brand. It’s so much better than regular bottled pasta sauce and it adds great flavor to this classic dish. The first time I ever had this sauce was a few months ago when we were at a friend’s house for dinner. She made a delicious chicken parmesan dish with warm tomato basil sauce over pasta. I loved the sauce and when I asked her for the recipe she told me about Bertolli brand sauces. You can buy them, and some of their other amazing products, at any Kroger brand store, where they’re currently participating in the “Tasty of Italy” program. 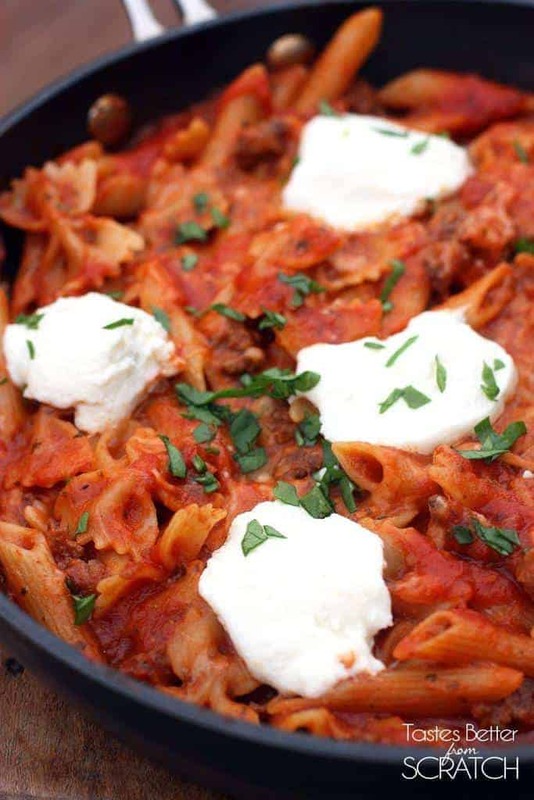 Their pasta sauces are perfect for nights when I really need dinner to be quick, and delicious! They’re a great compliment to any Italian-inspired recipes, like this one. Hope you enjoy this recipe and follow me for more great dinner ideas! This is a sponsored conversation written by me on behalf of Bertolli®. The opinions and text are all mine. Thanks for this recipe! Our family loves it. We leave out the ricotta(we aren’t big fans of ricotta) and add extra parm. So yummy! It was a big hit with my picky family. I doubled the pasta and added more cheese because we love cheese here. I will share this one.